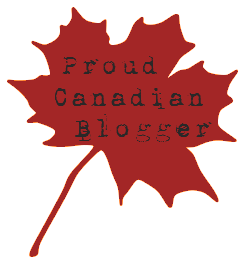 I have set up another blog for just my book reviews here if anyone is interested. sorry but I am taking a long, long break. 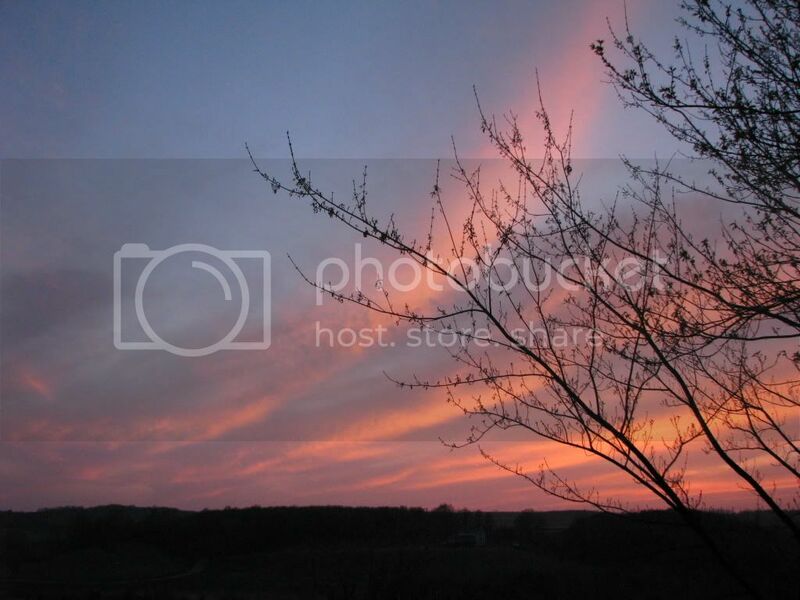 The blog will remain open for people to look at but I will not be checking comments, and with this post, you will not be able to leave a comment. I have a number of reasons as to why I will not be blogging, one of the ones is that my heart isn't in it anymore. If you do need to get in touch with me, please feel free to contact Jane and she will forward a message onto me. One thing I do have to say is a big thank you to people in the blog world for their kindness and support, it's been a blast and I have made many, many friends. This week's Home of the Week is overall okay, but I DO NOT like the furniture. Also what is going on in the last photo, is that next door garage as well? I actually love the wall paper in the powder room, despite not being a huge fan of wall paper. With the way it is staged though it does not look like a house that is comfortable and lived in, especially on the main level. Thought it was funny they have a sitting area on both bedroom floors; I guess you could get tired walking up and down all those stairs? Also have a Condo of the Week this week and if I had the money to buy it; it's on for $1 million and have over $1,000 a month to spend on condo fees I think I would go for this. Those windows are just stunning; as are the views; plus you're right in the thick of things downtown. 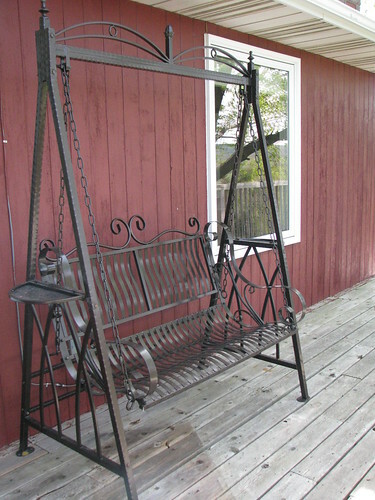 My only gripe is that there is no outdoor space, as it would be neat to sit on your balcony and watch the world go by. I even love the kitchen and the way it's laid out. If you want to see a really cool wedding photo, click on this link and see the photo and read the article it's really neat. 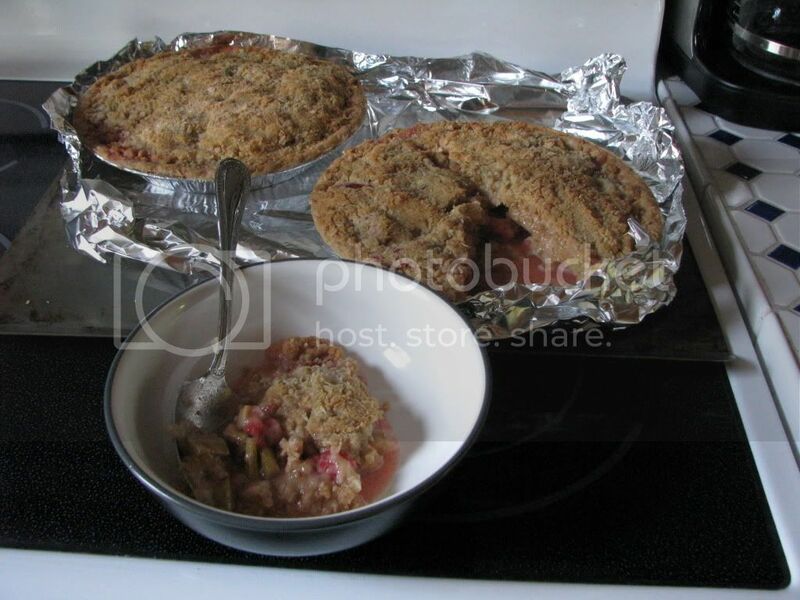 Picked some rhubarb from the garden and made a couple of Strawberry and Rhubarb Crumble Pie's. I reduced the sugar to 3/4 cup and didn't include the egg. Make sure you put some tin foil under the pie dish as it will more than probably run over. I was reading somewhere that their mother is still alive. It must be so hard for her burying three of her sons. No parent should have to bury a child in my opinion. Do you like the Bee Gee's and do you have a favourite song of theirs? First let me say the weather was too hot for me. I know am I ever happy with the weather........not really. Temperatures in the 30's oC do not suit me, and as I am a stubborn old thing, who thinks that as its only May why would we put the a/c on this soon, we suffered in the heat. Saturday morning, ds arrived for a couple of hours and along with dh dug over some more of the veggie patch. By lunch time it was too flipping hot for us, so we went to Home Hardware in Shelburne as they were having their yard sale. Picked up a couple of things, then decided to go to our friends and dig up three more saplings. They are huge one being at least 12 feet high, we immediately put them in a garbage bin of water to make them less stressed. Sunday morning I planted the trees and have to say they still look very stressed, so fingers crossed they take. Again by lunch time the heat was just too much for us. We then decided to go out and buy some more weedkiller for the driveway as I think we have found one that actually works. It's Scotts Path Clear. We bought the 1 litre concentrate and use our own applicator to apply it. Monday morning had us out in the garden by 7:30 a.m. in the hopes of beating the heat. Dh managed to rototiller the part of the veggie garden we had weeded, and I got four rows of potatoes put in, and some other veggies. I also got a couple of raised beds finished off and planted. One has garlic it in and the other has strawberries in it. At lunch time dd arrived and we had pulled pork sandwiches and she brought over baked beans, I must get the recipe from her, as it was good. We went out to Home Hardware again as they had some under layment on sale for laminate flooring in the basement. It should have been $50 a roll, we paid $25 a roll, can't beat that. We don't have any intention of doing the floor until the Fall, but it was too good a deal to pass by. We also did a number of other things over the weekend, but those were the main jobs. It's just a shame it was so hot over the weekend, as we could have got a lot more done. Thankfully it's a lot cooler today, so I am having a day in the house to try and catch up as you can write your name in the dust around here!!!! Cole McKenna can face dangerous rescue dives. He can face the fear a murderer may be threatening his town. But facing the reality of Bailey's reappearance is a tougher challenge. 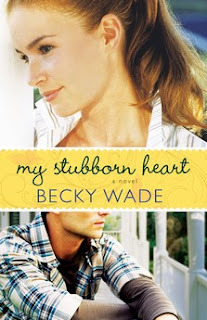 She broke his heart... but doesn't seem to be the same girl who left Yancey ten years ago. And he's not the same guy she left behind. 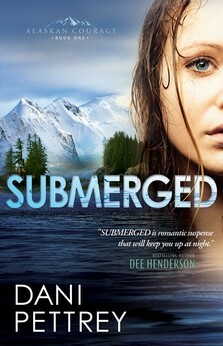 Never read a book by this author, but after this one I'll be looking out for her books, and can't wait for the second book in her "Alaskan Courage" series. This book had the right amount of mystery and suspense; the right amount of romance and the right amount of faith in it's pages. The lead character's Cole and Bailey were perfect, and the book introduces you many more characters, that I hope will feature in her up coming books. I enjoyed the Russian History aspect of the book, and that it was set in Alaska, a place I would love to visit. One of my biggest gripes with books is the way they end; I had no problem how this book ended, it all made sense and it left you wanting more. Stars out of 5 : 5 and a very solid 5 at that. I was hooked from the beginning and needed to know what was going to happen next. A really, really good book, very well worth while reading in my opinion. So we have gone from miserable cold weather to stinking hot weather. I swear there is no in between over here. As I say every year Spring is gone in a blink of an eye, so we end up thinking we had no spring. Spent Saturday morning in the garden, by lunch time it was too flipping hot out there, so we ran some errands and picked up three more saplings at our friends house, so guess what I am going to be doing this morning!!!! Lets just pray and hope my back holds out, as its sore this morning. Dh is going to dig over more of the veggie garden. However I am guessing by lunch time it'll be too hot again as we are expecting temperatures up to 30 oC today with the humidity...............oh yes, the dreaded "H" word is appearing again, HUMIDITY!!! Heat I can tolerate, Humidity though just wears you down. Finally input my grocery totals for the week and I spent a total of $54.96 with coupon savings of $12.40 this week. So I have $51.05 left for the month, as my monthly totals are $248.95 spent and a HUGE $338.78 in savings. I cashed in my air miles this week so have $40 in Metro gift certificates. There are some odd cleaning things I need, like carpet cleaner which is a one off, so I may use the certificates for that. Regardless I am super pleased with how this month has gone grocery wise. Have you stayed on budget with your grocery bill this month? Do you have a monthly budget for your groceries? I was in two minds when I decided to pick this book and only chose it because it featured the Appalachian Trail, which is something I find interesting. It would be something I would love to hike, if I actually did hike - but as I get out of breath just walking around the acreage, me hiking over 2,000 miles is totally out of the question. 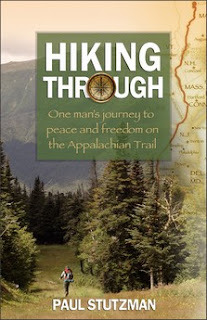 It was fun the "walk" along with the author through his book and the way he talked about his adventures along the way, made me glad I was "walking" along in the comfort of my armchair!!! I had to keep on reading as I needed to know what was going to happen next, and to be thankful it wasn't me!!! Although it would be a super way to lose weight that's for sure!!! This book however was as much about how the author came to terms with the loss of his wife and how he healed from that loss through this journey and his spirituality. This book also helped me learn more about hiking and more about the Appalachian Trail and the world of "thru hikers." If I didn't have to get wet, didn't have to sleep in a tent, didn't have to forgo a shower everyday, I would love to hike the Appalachian Trail. However after reading this book, the chances of any of those things not happening, are slim to nil!!! Stars out of 5 : 5, infact I would give it a 10 + as I really enjoyed this book. It truly is a good read and will keep you wanting more!! 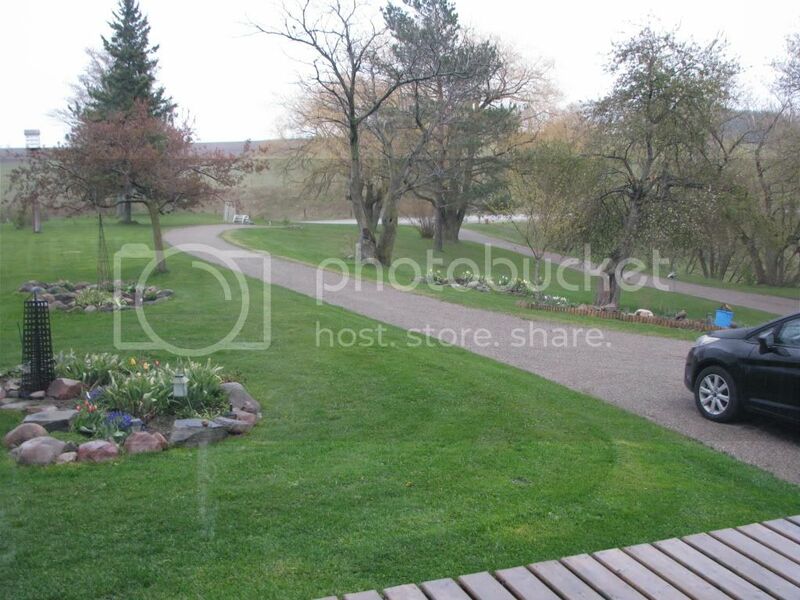 The one thing I adore is a nice green lawn with straight cut lines. If it looks like a carpet I am a happy camper. I have been told time and time again to leave the field long and make it look like a meadow and only cut it a couple times a year. I can't do that it looks too untidy to me, plus it then gets full of mice and snakes in the long grass. So although it takes me 8 hours to cut all the grass and a small fortune in gas.........around $20 + a week, I really like it to look tidy. I even get grass envy whenever I go past this golf course as their grass is stunning. I am practically drooling as I drive past. The grass on the greens look like green velvet, yes I know they use lots and lots of chemicals, but it looks so good. I don't use any chemical on our grass so that is why it is full of weeds. I do mulch when I cut the grass so that helps, plus I try and cut the grass a different way each time I cut it so it grows in thicker. From what it looked like when we moved in to what it looks like now is night and day. So although I appreciate you all feeling bad for me having to cut all that grass at the end of the day it's my own fault that I am so bloody picky. 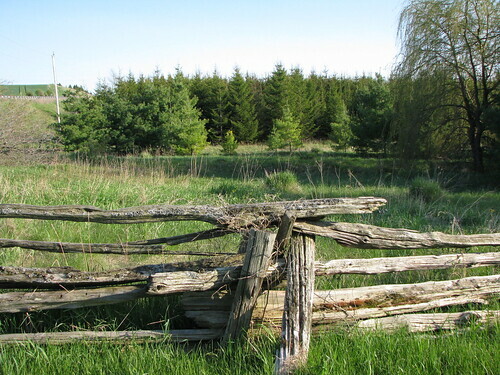 Fortunately for me I don't work outside the house as if I did I wouldn't be able to maintain the property. It would be too much with working full time and trying to keep up with the house. Dh does help out now and then but he is busy renovating the inside of the house. Although this week's Home of the Week is really nice, at 8 million dollars it's a tad pricey, don't you think? Granted the views from the back are great, and who wouldn't want a heated driveway, so you never have to shovel snow, but 8 million? For that amount of money I would like a bit more room between me and my neighbours!!!! Summer must be coming as we are back to Cottage of the Week again. This week however the cottage is just for rent at $7,500 a week, yes you read that right, $7,500!!!! I love the look of the "cottage" mansion but do not like the ultra modern touches throughout, like the island in the kitchen, it just doesn't fit in to my mind? The owners are going to put it up for sale; I dread to think how much they will want for it.........my guess at least $4 million..........though probably closer to $7.5 million!!! So what was I up too on Wednesday? 4 1/2 hours cutting grass. So I started the day whipper snipping and managed two hours before I ran out of line. I probably have another 8 hours worth still to do, yep I said 8 hours, one of these days I will be on top of the situation, just not sure which year that will be. I then did some grass cutting, and infact split it up throughout the day. Sitting on the tractor more than a couple of hours at a time is about as much as my back will take. Still I had got a lot done and probably only have a couple of hours to go until I am finished it all again. Mind you by the time I get everything cut it will be time to start again, as I swear I can see the grass growing. As soon as the weather gets warmer the grass will grow more slowly.........I hope!! It's garbage day today, so I took a garbage bag and went around the property and picked up the garbage that people had thrown from their cars. It wasn't too bad......bad enough but at least there wasn't garbage bags full of stuff that people had dumped like in prior years. 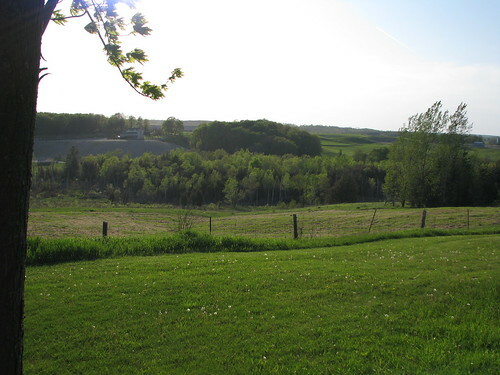 I was thinking back to the days when we lived in a subdivision house and when it only took a couple of hours to cut the grass and trim the edges. 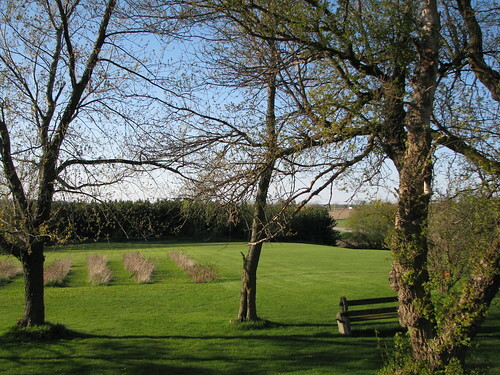 With having the five acres, just cutting the grass takes 8 hours. 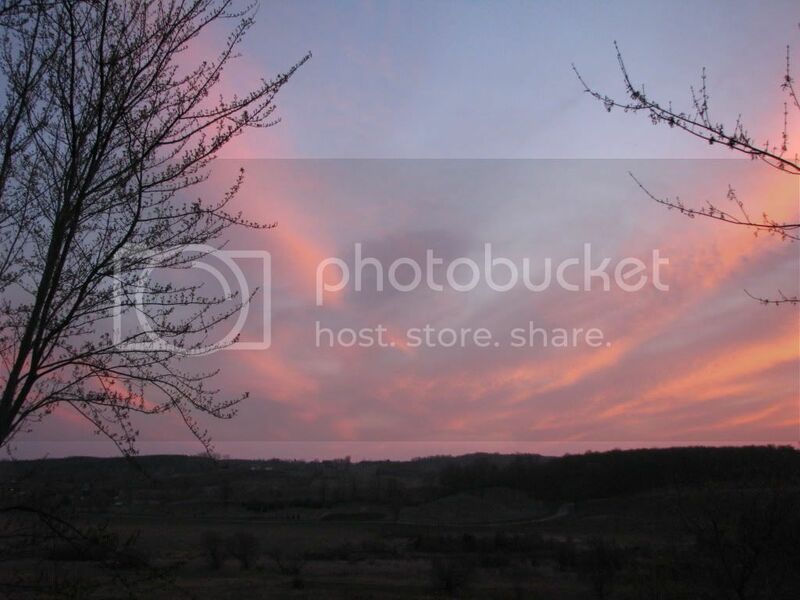 One thing for sure, all this fresh air makes me sleep well at night!! This is NOT how I cut the grass!!! 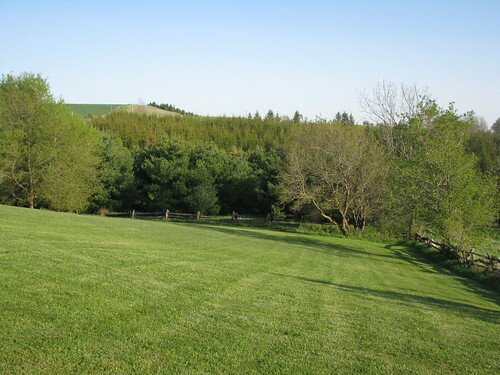 I cut the grass on Kamikaze Hill on Tuesday and thought I'd take a few photos from that side of the property. 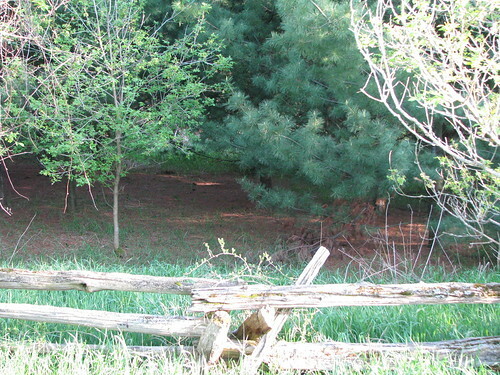 The couple who bought the property above us, which includes the field behind us. They have a horse and want to ride it in the field behind us. As the grass has never been cut, other than the acre of field I burned last year, it is long and he is now in the process of cutting it. 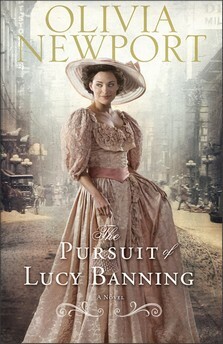 Get swept away into the lavish world of Chicago's high society as Olivia Newport brings to life an age of glitz and grandeur, stark social contrasts, and one woman who dares to cross class lines for what she believes. This book was okay, it was an easy read, it just lacked something, it was just a bit "fluffy" for my liking. I have read a lot of similar books where rich girl does good works to occupy her time, is due to be married to rich boy but then falls in love with poor boy. There were twists and turns along the way of course but nothing too earth shattering and I more or less guessed what was going to happen next along the way. However my biggest gripe was how it ended. It just ended to my mind in the middle of no where, not at the full stop if you get my meaning? Stars out of 5 : 3.5 It was a light read when you want to read a book that doesn't stretch your brain. I just wish it had, had more substance in the book. This is a wonderful book and be warned you will need a box of Kleenex/tissues as it is sad at some points. This book shows you strength people find when they least expect it. Also how really small this world is and how things happen for a reason. There are a couple of twists and turns in the story that you will not expect but it does not disappoint. Stars out of 5 : 5 I was hooked from the beginning and had to know what happened next. I loved where it was set and how the characters were formed in the book. You felt for each of the characters by the end of the book. Another super book by Ann and a book well worth reading. The last paragraph of the synopsis made me wonder what was going to happen in this book and it isn't until close to the end you discover This book captured my attention from the get go, it was an easy book to get into and it kept my attention right to the very end. The characters were perfect for one another and even the secondary characters, "the oldies," were fun, especially Beverly the Gran. This is Becky's first novel and it is a good one and an author to watch for in the future. Stars out of 5 : 5 a great read, that doesn't require a lot of time or a lot of deep thought. 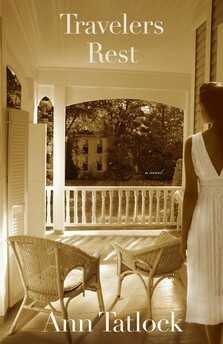 A great book to read while on vacation or when you want a few hours for yourself with a good book. Now to be fair we got a great deal on it. It should have been $500 and we got it for $200 + taxes. So thank you to our generous children for buying it for us. 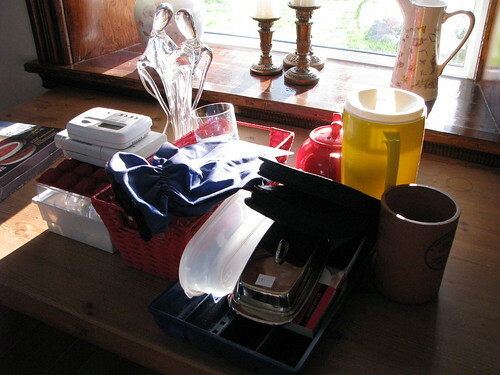 I donated everything to the church garage sale. It's been another busy weekend, we got a few things accomplished in the garden though, so that is good. Got a list a mile long though of things I need to do this week so lets hope we have good weather. Are you going to be busy this week? 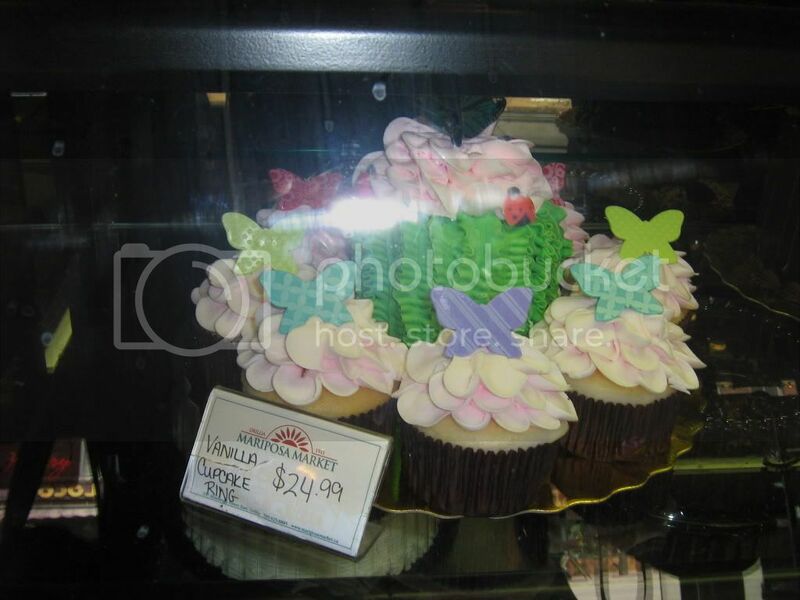 Happy Mother's Day and a "grocery shopping brag!" It's Mother's Day over here. I'll post a photo tomorrow of what me and dh got off the kids as it was a joint present. If I had paid regular price for everything without coupons and my points I would have paid $250.71. After using $31 in coupons, and cashing in $200 worth of points I paid $19.71 out of pocket. I will say that took a lot of planning on my part, looking at the flyer and checking what coupons I had etc. Then it took me another hour just to do the actual shop itself as they didn't have some of the items etc, so not a five minute job, but with those savings it was well worth while. 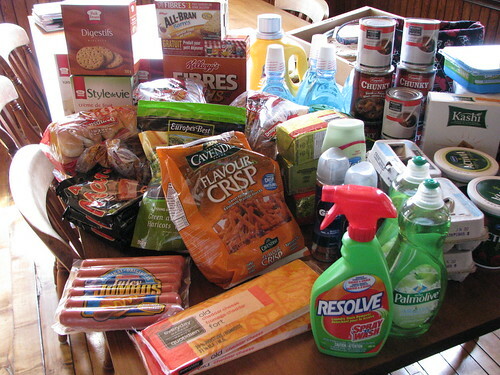 I shopped at No Frills also this week and used $50 worth of PC Points that I collect when I use my Mastercard, and along with coupon savings of $14.10, I spent $79.57. 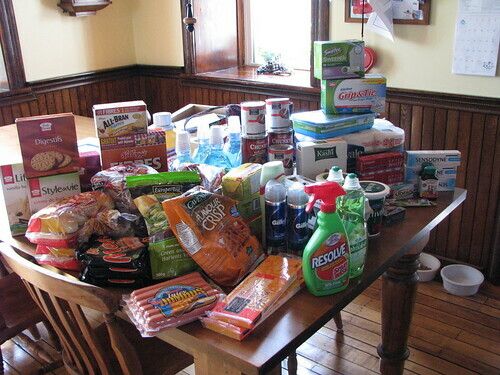 I then cashed in $5 worth of Sobeys points at Sobeys bringing my total there to $2.79. I am stocked up on a number of things, so although I am over budget on a week to week basis I hope to be under budget on a monthly basis. My month to date totals are $193.99 spent with savings of $326.38!!!! Wish every month could be like this!! Thursday although sunny was flipping cold in the wind. 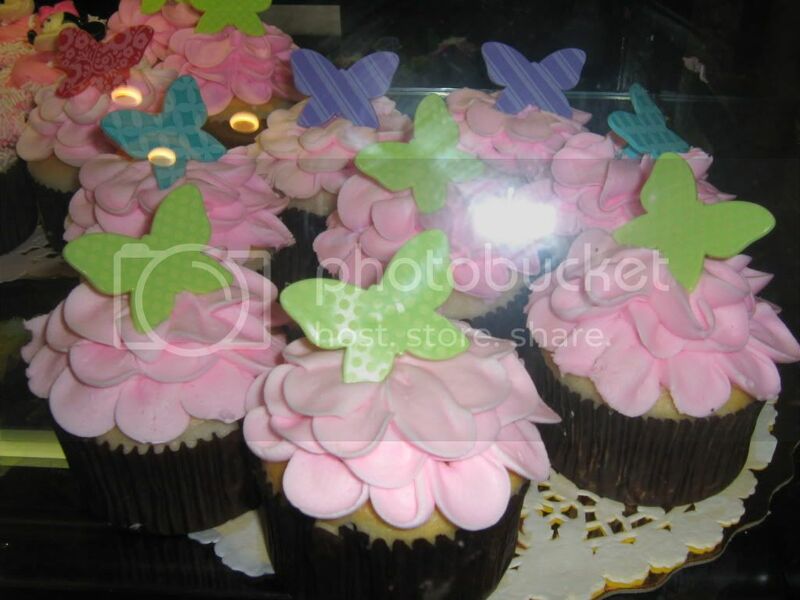 Dh was off work for the day so after he was finished with his appointment we were out and about running errands. We were shocked to see a lot of people wandering around in shorts and t-shirts, didn't think it was that warm. 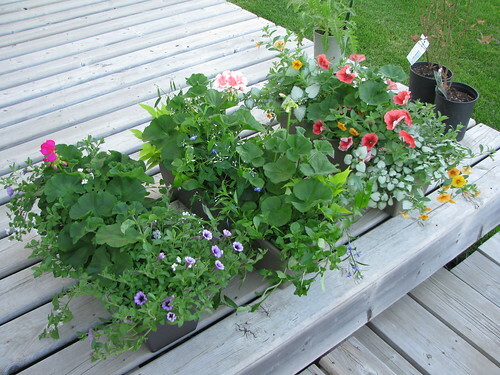 We called in at Garden Gallery in Barrie and I bought three window boxes. The only problem is they have to be brought in each night, as its too cool on a night yet. 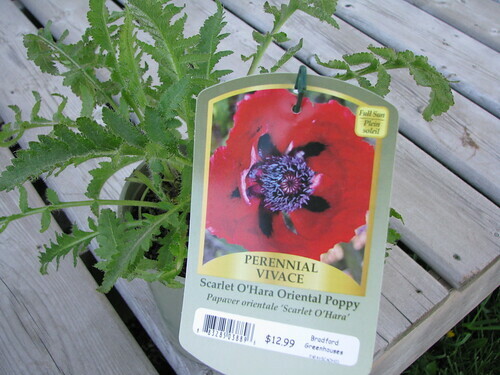 I also bought a poppy as they are one of my favourite flowers especially the bright red ones. 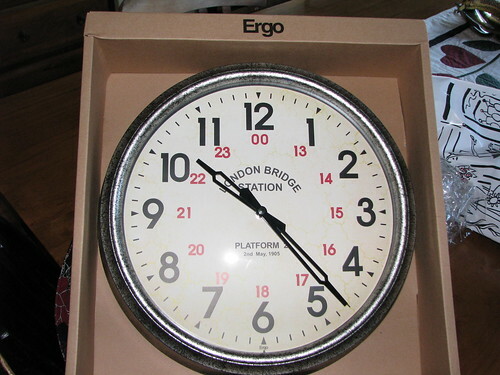 We also called in at a store in Alliston called Details and got this clock to put in the garage. When we got home I finished off the field and must say from a distance it looks pretty good, however close up there is more weed than grass.........just as well the weeds are also green!!! Going to be busy over the next few days, so if I don't get chance to post, have a super weekend. If you're curious about what a "Flap's Down" Type of Day is check out this post and this post. It was a lovely morning on Wednesday, so I got out in the garden to finish off a couple of raised beds. When we got the windows replaced in the new basement I kept the old windows as I thought they would make cold frames. 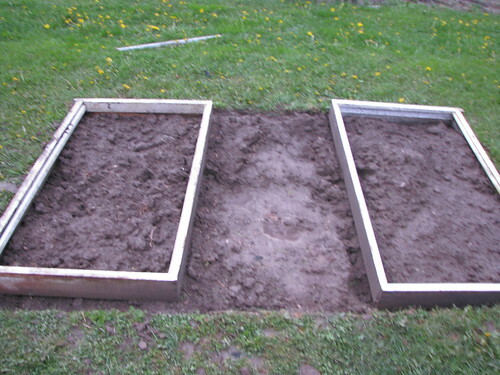 Anyhow scrapped that idea and made a couple of raised beds with them instead. 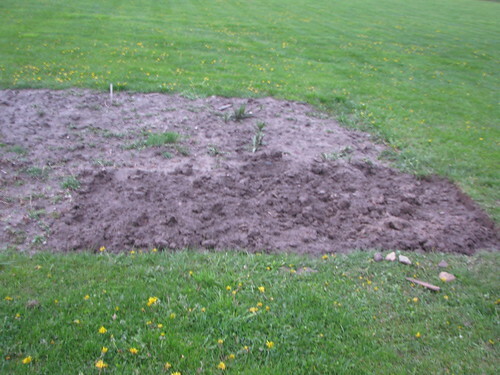 I am going to put garlic in one of the beds, strawberries in the other and in between I will plant my gladiolus. Now let me know if that is not a good idea? 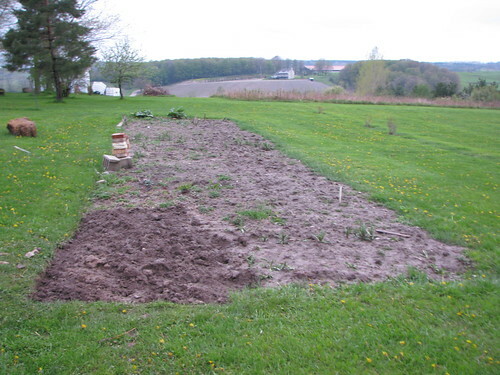 I still have to finish the beds off, but at least the hard work of digging the beds out is done. This shows how much more I still have to do!! Luckily I have company coming over on Saturday and I will see if they will help me with the weeding. If they don't help they won't get fed!!!! After having a cup of tea I decided to tackle cutting the field again, however by lunch time it started to pour and never stopped all day. I want to get my potatoes planted this week if possible. Not doing too great this month with the grocery budget as I have already spent $91.92, but have had savings of $27.77. Mind you $17 of the total spent was on allergy medication, as my allergies are playing up something awful. Wasn't sure if I should include the pills in my total, but decided to do anyway. 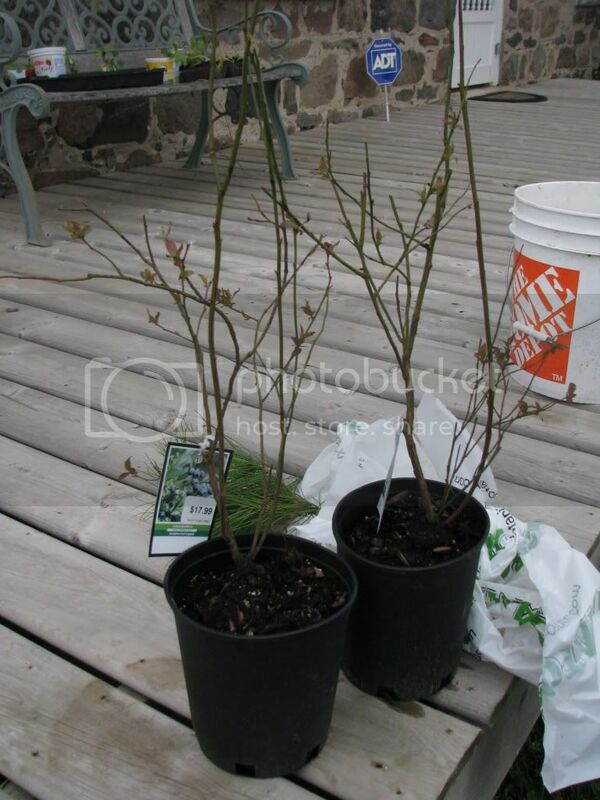 On Tuesday I popped into town to run a couple of errands and I picked up a couple of Blueberry Bushes, variety Legacy. They were on sale for $6.99 each. They look very straggly but you never know they might be okay. 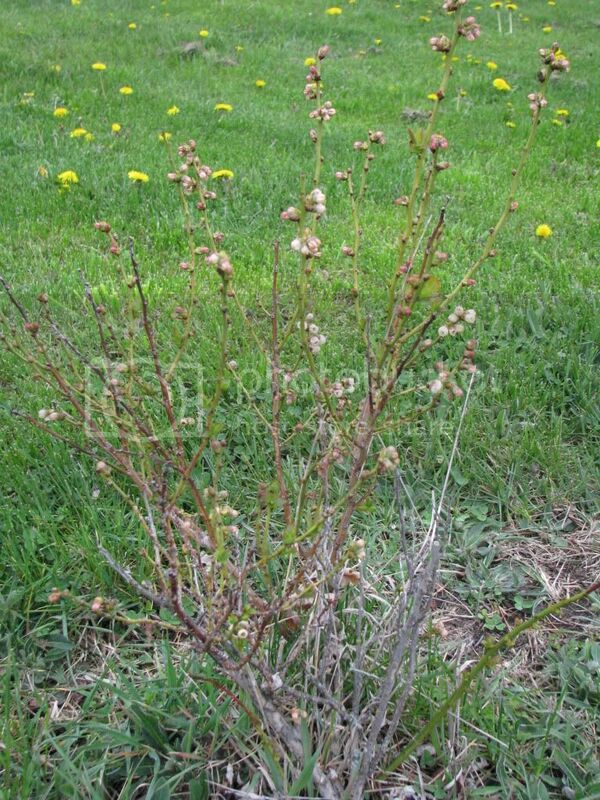 This is one of my blueberry bushes that I already got growing. 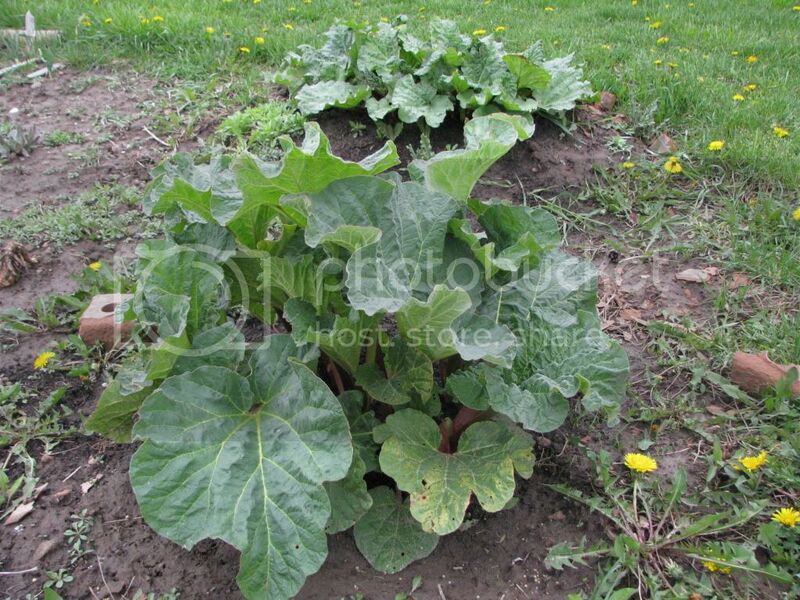 The rhubarb is growing, and so is the dandelions and weeds!!! The other day when I was at the garage sale there was a table that was being run by the Gogo Grannies of Orangeville. I had no idea what they were all about and I talked to a lovely lady called Cathy who told me all about the organization. The name gogo is Malawi’s Chichewan word for grandmother/grandfather, you will also find the same name in other African nations as well. The Stephen Lewis Foundation launched a Grandmothers to Grandmothers Campaign to encourage awareness in Canada about the African Grandmothers struggle to raise children that had been orphaned by AIDS. They also want to build solidarity among African and Canadian grandmothers in the fight against HIV and AIDS. The money the Gogo Grannies of Orangeville raised from the garage sale was part of their fundraising for this cause. This seems to be such a good cause and there are branches all around the country, and I am sure there must be similar organizations in other parts of the world. Where did the weekend go too? It was over in a flash and I have to admit with barely a minute to relax. It started on Saturday morning at 5:30am when I got up to get myself ready to go to a garage sale. Our township, was having a garage sale and I had booked a table inside back in February for $10. Turned out to be a lovely day weather wise but cool, so I am glad I paid the extra $5. There were 50 vendors and it was a great morning. I came back with very little and made $69, but more important got rid of crap treasures that had been laying around!! What I have left is being donated to a church garage sale next week, so it's a win, win situation. I got home around 1pm, had a bite to eat then popped into town to spend my $69 on gas/petrol for the car and my gas containers for the lawn tractor. Cost $80 but with Canadian Tire having a 10 x the CDN Tire $ I got $2.50 back in CDN Tire money. Came back home and then dh took me into town to get some grocery shopping and run a couple other errands. As we were heading home dd was on the phone as they had seen a house and were wanting to put an offer in, but could we (mainly her dad though) come down and give it the once over to make sure they weren't making a mistake. So after unpacking the groceries we set off at 4:15pm to go to Pickering. Luckily the traffic was light and we got there by 5:30 pm. It was 7pm by the time we left the house. I sat and talked to the real estate agent after looking around the place, while dh, dd and son-in-law, looked at the house in great detail. We had something to eat on the way home in Schomberg, at a great little place called Cross Roads Fish and Chips (serves a lot more than fish and chips) which is on Hwy 9 at the main lights. So it was 9pm when we finally got home. I sat down had a glass of wine, which I know is very strange for me as I normally don't drink, but I saw a bottle of Jacob's Creek Moscato on sale in the LCBO and it is fizzy and is sweet, my kind of drink!!! My head just hit the bed and I was out for a count, but it had been a full and productive day. Sunday I had a lay-in and didn't get up until 7:30 am which is late for me. Then I basically spent the whole day out in the garden, most of it cutting the grass. I am now pleased to say all the grass has been cut at least the once. 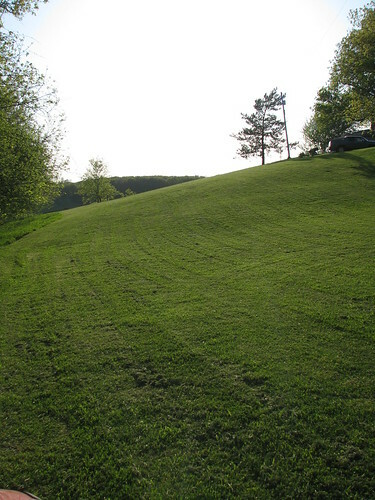 That first cut especially in the field and on Kamikaze Hill is hard going as it had gotten so long. I want to concentrate on weeding and prepping the veggie patch this week, if the weather holds out. So there you go a crazy busy weekend, oh and dd and son-in-law bought the house and got it for under asking price..................only because it needs a bit of work doing on it.................but to hear their excitement in their voices is such a blessing and a joy. Don't panic its not me, no one in their right mind would buy this place in the state it is in............mind you we bought it, so I guess there are fools out there!!! Actually I love our house and when we do get it all renovated it will be even more gorgeous. Dd and son-in-law are house hunting at the moment, as they are getting kicked out of their condo in August. They hadn't planned on buying a house until next Spring but as they say "things happen!!" Now the only reason I am even mentioning this is they are running into one bidding war after another and it's proving to be a very eye opening experience. What the houses look like on MLS and what they are actually like in person is night and day it seems. We went with them to look at a couple of houses last Saturday. 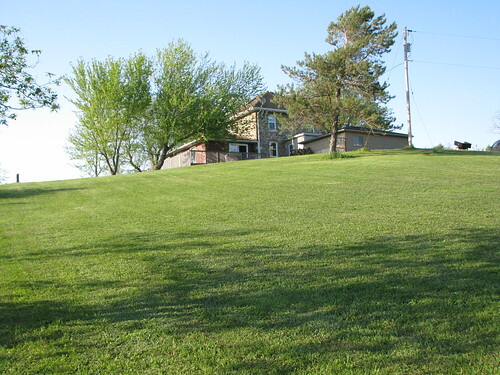 The first one was a lovely older home (1979) detached and was on sale for $379,900. It was perfect for them, although it did need new windows upstairs and a couple of other things. It went on the market on Friday night, by Saturday night it had four offers in, including one from dd and son-in-law and sold for $390,000 with no conditions. YOU DO NOT BUY A 1979 WITHOUT A HOME INSPECTION!!!!! Dd offer was not the one that won that one. The second house we visited was a semi on for $349,900 and around 15 years old. It was a house that the real estate agent was selling. It too had just gone on the market and had been staged/cleaned up. It was still filthy to my mind. It needed new carpets right the way through, the layout was all wrong and basically it was horrible, and son-in-law agreed with me. However it was in THE location the kids wanted to be in. The real estate agent wasn't taking offers until the Tuesday, and she got SIX offers and it sold for $380,000!!! They have made appointments to see various other houses only for them to sell before they get to see them. As I said before a lot of houses look good on paper but are a nightmare in person. They saw two houses the other night that looked really good on paper. The first one stunk of smoke (no offence to any smokers out there, but don't smoke in your house if you want to sell it.) As dd pointed out, all the carpets would have had to be replaced and the whole thing decorated and aired out as it smelled that bad. The place was cluttered and the back yard was all deck, plus there were other things wrong with it. However on paper it looked good? The other one's owners had done bits of renovations here and there and had not finished things which made for more work, all what you couldn't see on paper, so again not for them. They are looking at another three today, so fingers crossed they see something that will work for them. I have never had the "pleasure" of participating in a bidding war on a house, but it's becoming quite common and someone was telling dd that in certain parts of Toronto that the listing house on a is nothing to go by. They currently live in the Yonge and 401 area of Toronto and a bungalow came up for sale for $400,000 it was sold for over 1 million dollars and the buyers are tearing it down and building a mansion on the lot!!!! It boggles the mind how people can afford to do that. Buying and selling houses have changed so much over the years and people expect to see more and more staging, multi media presentations. My boss just sold his house and the "bound book," that was used to sell his house was stunning. It wasn't a colour leaflet it was an actual book with stunning photos and information about the area the house was located. Gone are the days when you take a few photos, and hoover and dust the house and hope it will sell. 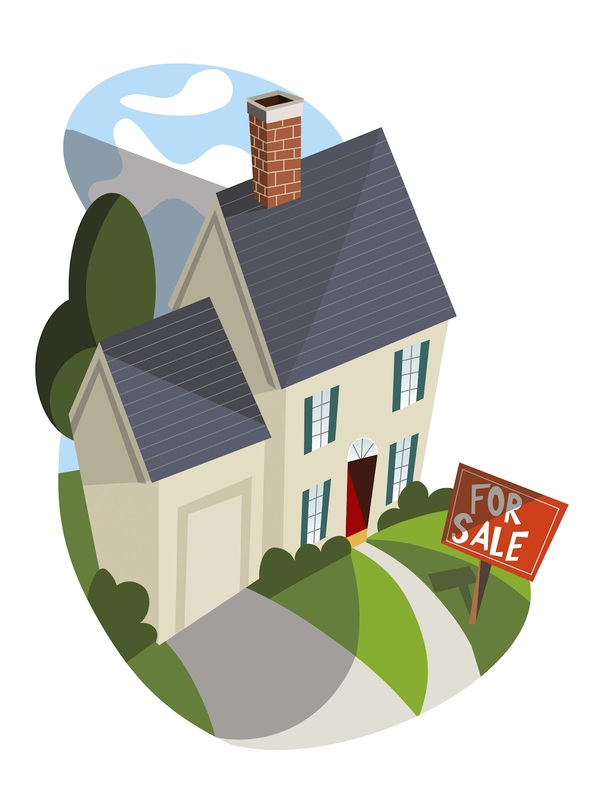 The houses that sell look like model homes, all the clutter removed, decorated neutrally and ready just to move into. Because at the end of the day when a potential buyer walks into a house, it's those first few seconds that count the most, as unless they fall in love with it right away you've lost them. I'm glad it's not me selling a house that's for sure!! I only pray and hope dd and son-in-law find something soon. As long as they find something by the middle of June they will be fine, so plenty of time yet. 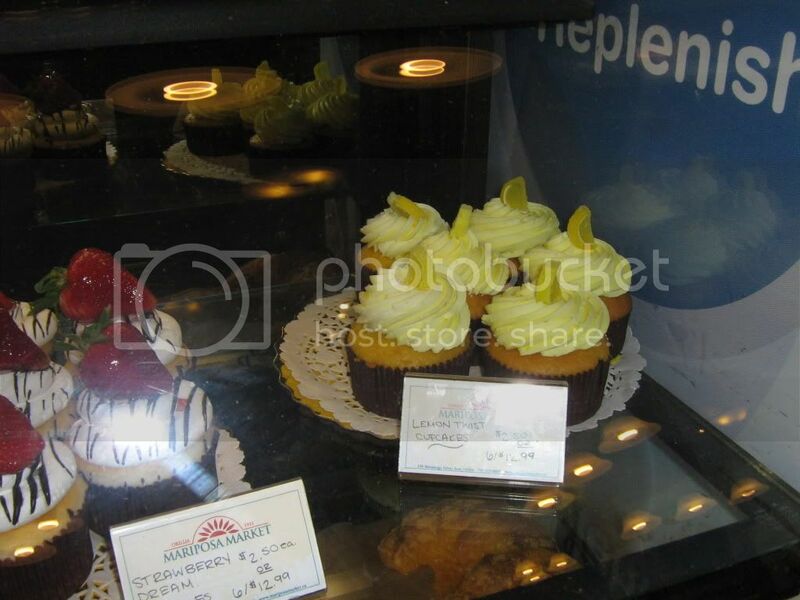 We stopped in for a coffee at the Mariposa Market and Bakery and I took some photos of the yummy cakes and cup cakes. I was good and I didn't buy one. Not sure about the ants on this one? 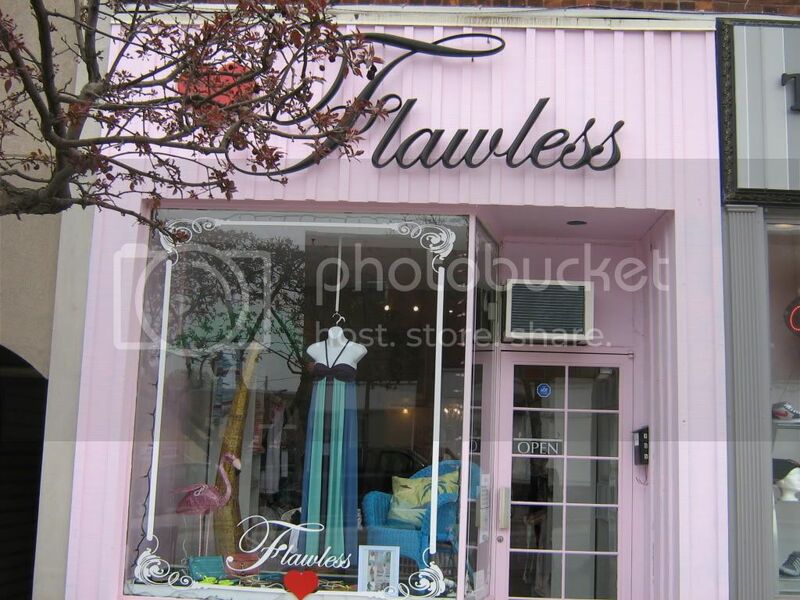 We also called in at this boutique Flawless as we both fell in love with the dress in the window. Thought that you would have to be 7 feet tall and a model slim figure to wear it. Jane has the slim figure but is not 7 feet tall. Anyhow against Jane it was the perfect length. The dress was by a designer called Ella Moss and we both loved her clothes. The skirt was also by Ella Moss and would have suited Jane as well. 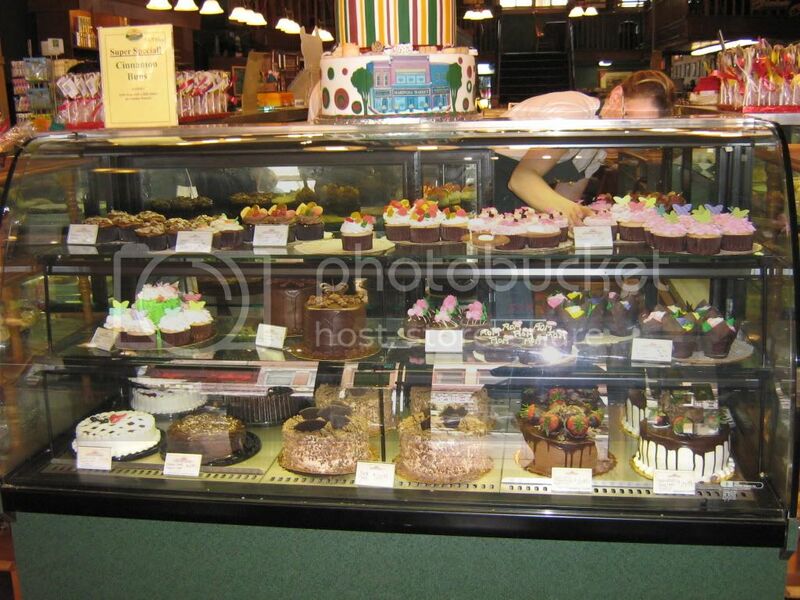 The owner of the store was a delight and very pleasant to deal with. Finally a photo of the pair of us. Can't wait until our next get together. 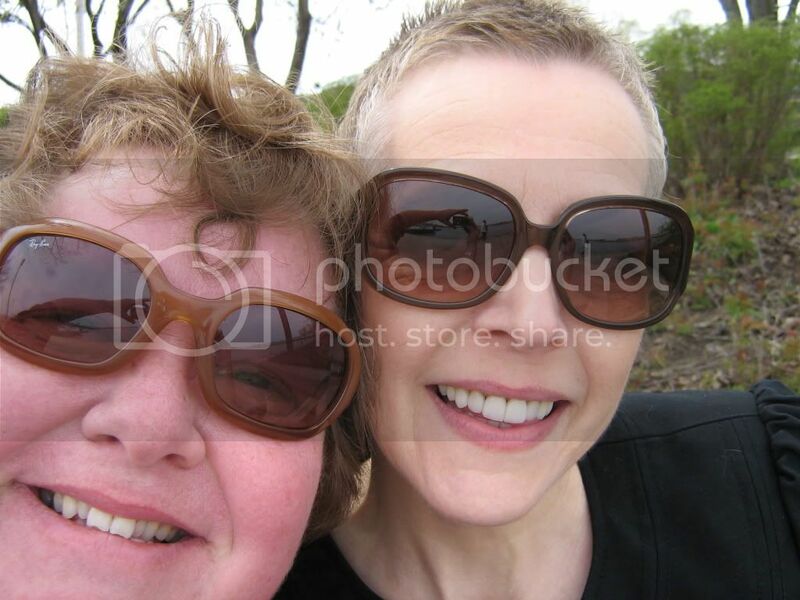 Met up with Jane in Orillia on Wednesday. It was my bright idea to park by the water front.......didn't realize we would be plagued with midges/flies, oh well never mind. Forgot we had to do a mountain climb/ hike to the restaurant, which was hard work when your mouth is going ten to the dozen the whole time.....oh well never mind!!! I know I could have kept my mouth shut, but we had plenty to talk about. Me, well I ordered the soup and salad meal, which consisted of cauliflower and ham soup and goat cheese and candied walnut salad. Jane took a photo of me looking in wonderment/disgust at the size of the cheese. 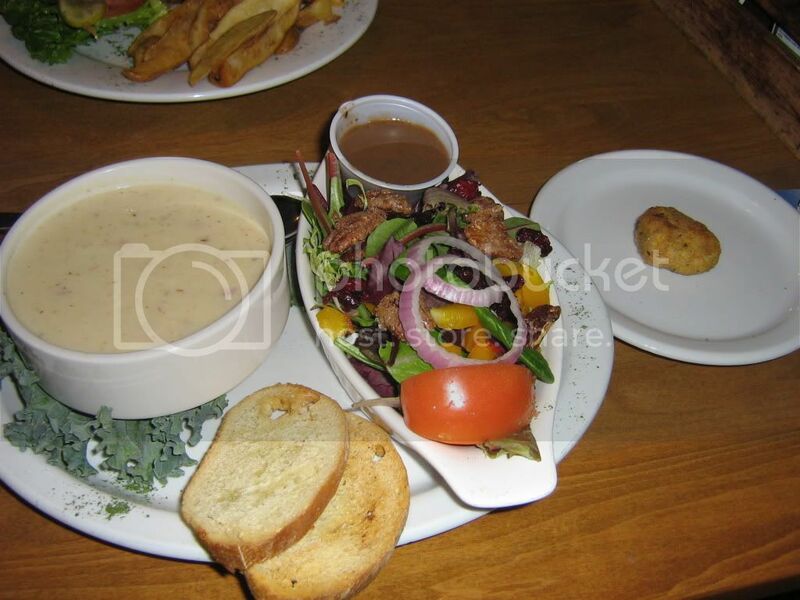 Now when our server dropped off our meal, it was minus the plate to the right with the round thing on it. We both heard the word puck and I'll be right back. She came back with the plate on the right and announced it was the goat cheese puck? I of course spoke before I really thought what I was saying and said "is that it?" Yep that was the goat cheese. Now to be fair it was really good and I did enjoy it, although the soup had a bit of a kick in it, however Jane pointed out there were flecks or red in the soup, so maybe that had something to do with the heat. I didn't have my glasses on so didn't notice them. After having the meal we popped in next door and had a stroll around the downstairs store called Apple Annie's and we drooled over many things..........well I drooled over the fudge and chocolate. I saw these mixes that were made with Bean flour? 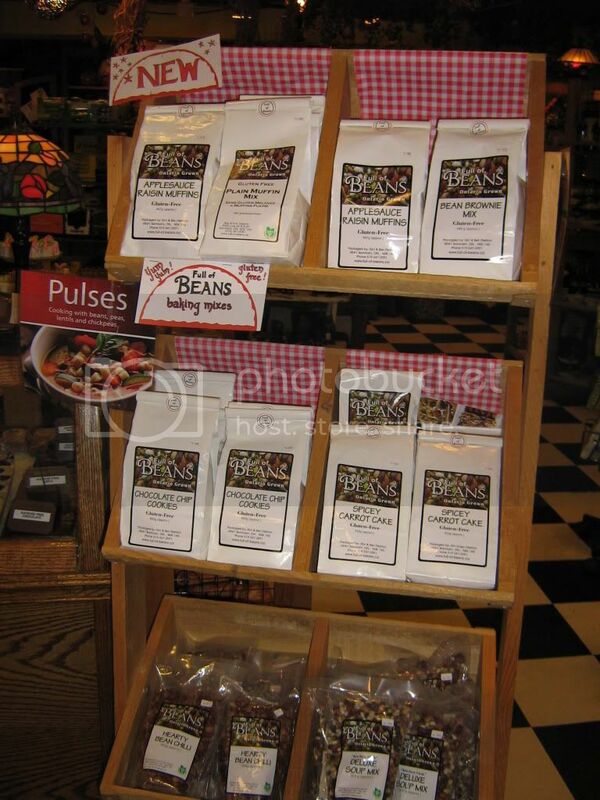 I have never heard of bean flour before and thought it was very interesting. 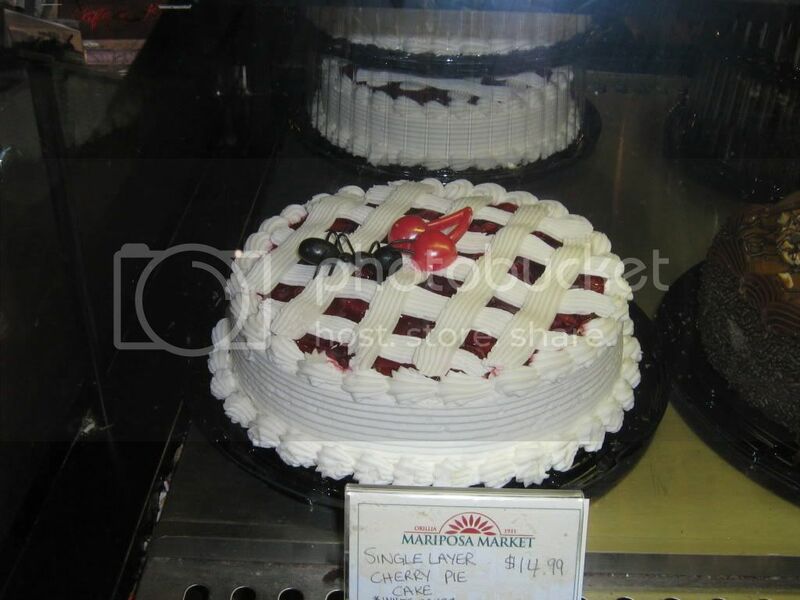 I found the web site for this product and it has some neat recipes on there and gluten free. 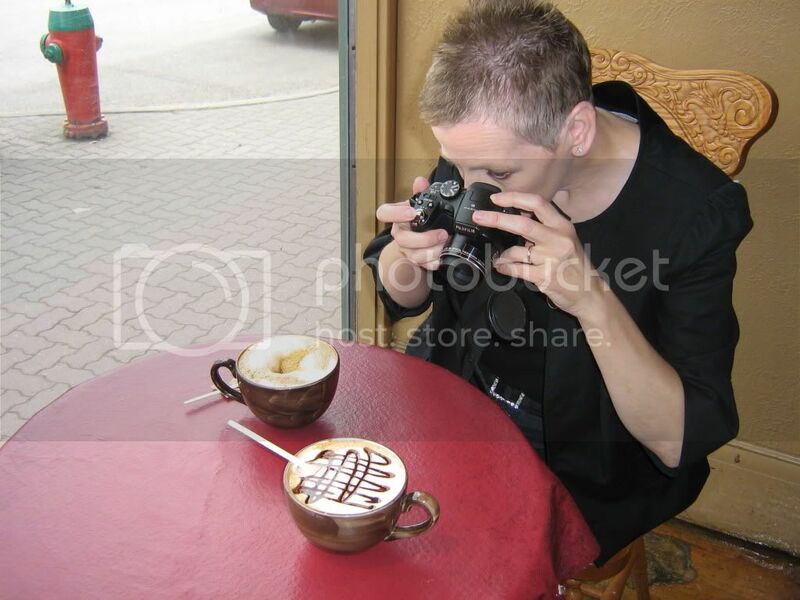 We then decided to have a coffee. 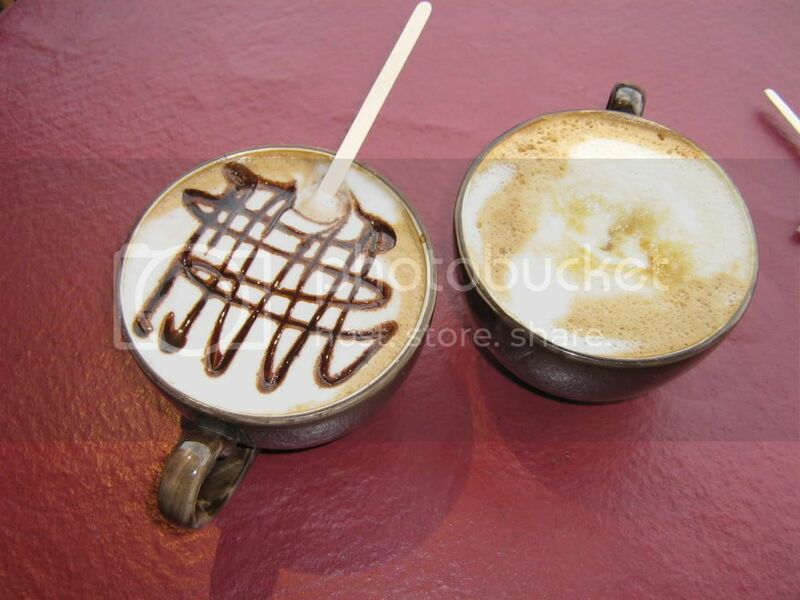 Jane of course had a Soy Latte (icky) and I had a Chocolate Orange Latte, which I must say was too sweet for me. 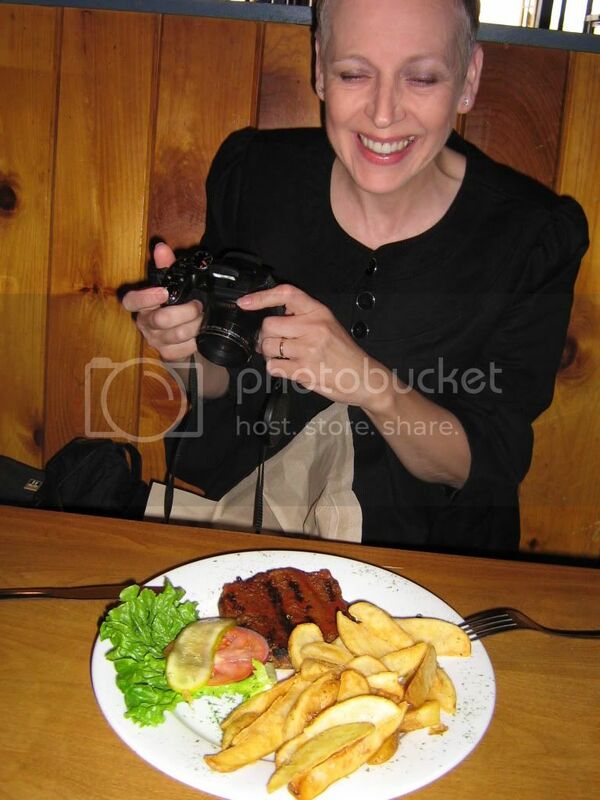 Now here is a photo of Jane taking a photo of the drinks, I wish I had, had the camera out before as I thought Jane was taking a photo of the table cloth!!!! It turned out she is not as potty as I thought she was; she was just seeing what the light was like to take a photo..............me not being as technical just pointed and clicked and prayed it all turned out fine!!! Our day didn't end there, oh no, but I feel I will carry on with our adventure tomorrow, as we had a lot of fun. Had a busy day cleaning and gardening on Tuesday and my poor back is telling the tale!!! I will be as right as rain in the morning as I am meeting up with Jane, really looking forward to it and we'll take plenty of photos!! Financially it was a flipping expensive month what with a new car, and a new driveway, plus nearly $1,400 spent on car repair bills, plus we had to fill up the furnace oil tank. I am hoping May is a cheap month for us, mind you I am touching wood as I write that!!! A couple of good things money wise, I did manage to stay under budget with my grocery totals for the month of April. I spent $298.99 for the month with $78.12 in savings. There is a good deal on until Thursday for free milk at some of the Loblaws chain of stores. Milk is on for $1 a carton and here is a link for a $1 off coupon, making it free. 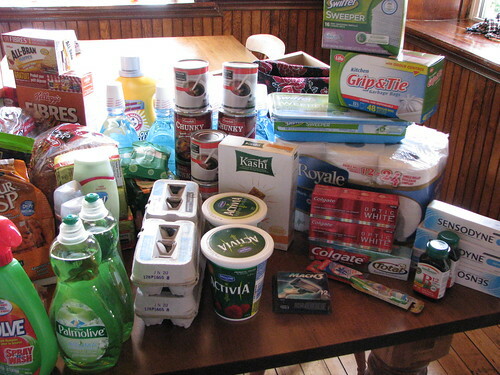 I am in for $300 total again in groceries, paper products, cleaning products and personal products for the month of May. I achieved another mini goal with Swagbucks. I cashed in enough points for $25 in Amazon e-cards, and have enough swagbucks as of the end of April for six $5 Amazon e-cards. As of the end of April I have enough swagbucks for 6 $5 Amazon e-cards, but can only cash in 5 per month. I am stocking up on Swagbucks so that when I get too busy I will still have enough to cash in for 5 $5 e-cards per month. I was able to order my soil for the garden using the money I had saved up in my loonie and toonie pot. Still putting money into our sealed pot, can't wait until December to see how much we managed to save. I am hoping to get some more weeding done this morning, weather permitting. How are you getting on with your garden?